I haven't posted about any flash trash since October 2011. Needless to say, I have bought many things since then, too busy to write and take photos. 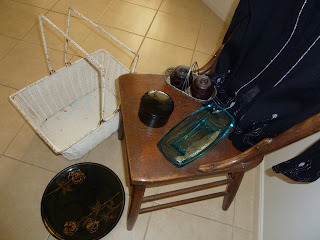 In February, I put the treasures that we bought at the last Double Bay council clean-up on Facebook. Wow, did we find some great things! The car was sooo full, I had to sit with junk on my lap all the way home. It was worth it. Today, as we drove out for breakfast, it was a stroke of luck to come across a garage sale. As the picture shows, we found an interesting old chair, a nice blue plate for my "blue" collection, a cane basket and three free items - a black glass plate with rose decoration, a nifty little salt and pepper set in a metal basket and a set of lacquerware coasters. On the way home, I found a nice silver and black cardy at our favourite Vinnies.